The task of a medical rep is tough. He needs to convince prospective clients i.e., doctors, who are knowledgeable about drugs and their clinical application than himself, about the benefits of his products. So, how can pharmaceutical salespeople “promote” their products to medical practitioners? Well, they need to be as knowledgeable as the physicians themselves. Many pharmaceutical companies are using a blend of instructor-led and online learning methods to train their sales force effectively. A good learning blend helps impart the best training because it helps companies provide a high degree of flexibility to learners. Learners can be involved better through various types of instructional material such as PowerPoint presentations, videos, online courses, and so on. It enables firms reap the advantages of the online learning medium, while retaining the “human touch” in their training programs. How to use blended learning to train medical reps? Here are a few tips to train pharmaceutical salespersons using the hybrid learning approach. Many drug-manufacturing companies conduct instructor-led training (ILT) sessions to educate their sales reps on the fundamentals of anatomy and physiology. These training sessions are usually held by doctors. This training can be supplemented by online courses containing animations, and videos. Most companies hire people who do not have an educational background in life sciences as reps, and these courses provide a basic knowledge of the human body and its functioning before they attend the instructor-led training. The online medium can also be used to reinforce knowledge of the human body, gained in the classroom. Short online nuggets, which can be accessed seamlessly on mobile devices, can be used as ready-reckoners. Medical reps need to have good knowledge of diseases and the symptoms of various ailments. This knowledge can be imparted through a blend of workshops and technology-enabled learning materials. Trainer-led sessions can be used to explain the causes of the disease, its impact on the human body, and results of studies conducted on the ailment. E-learning can be used to complement this training. Online courses containing graphic elements can be used to depict the effects of diseases effectively. 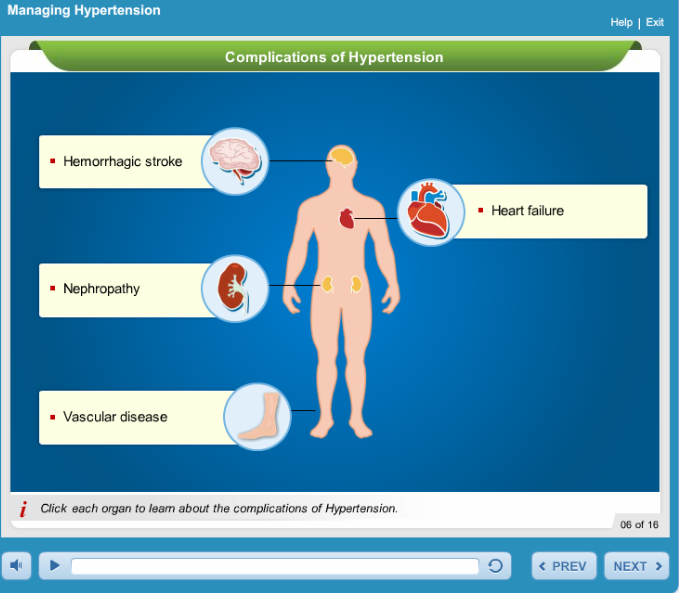 Below is a screenshot from one of our courses, which explains the complications of high blood pressure. Thus, we see a blend of instructor-led and online learning methodologies can be used to train medical reps effectively on anatomy, physiology, and disease conditions. In my next post, we will examine how hybrid learning can be used to train pharmaceutical sales reps on other vital aspects viz., working of drugs, interacting with physicians, and addressing their questions and objections. Check out the eBook Integrating ILT Initiatives with E-learning for more insights into the formulation of a blended learning strategy.